I LOVED every minute! Your energy and enthusiasm for all things Tarot is palpable and contagious. Your insights into the world and the cards of Tarot let me know that I was working with a true Master!!! The demands of daily life can leave us feeling drained, hurried, and disconnected from our own hearts and minds. It is crucial to set aside time for ourselves to replenish, recharge, and reconnect with our own inner voice, our own Inner Goddess. No Tarot knowledge required. If you have your own deck, please bring it. Please also bring a notebook and a pen, and anything you need to feel cozy and comfortable. Then, we will lock that intention into a gorgeous genuine sterling silver and gemstone pendant and create a practice that you can continue to use long after the class. For this workshop, I have chosen LEPIDOLITE as the crystal we will work with. I adore this gorgeous purple stone, somehow it fits with the shadow and mystery of October, Samhain, Halloween. Lepidolite soothes fears and anxieties, leaving us feeling uplifted, balanced and calm and ready to go deep into the cards and ourselves. 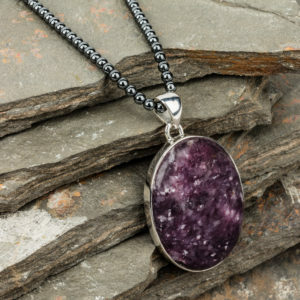 Your lepidolite pendant is a genuine stone, set in sterling silver, on a hematite beaded 18″ chain. This class is firmly limited to EIGHT participants. Your day includes the workshop, your talisman, and instructions on how to work with it in future. Tarot is much more than fortune telling. These cards are also powerful tools of magic and manifestation that can help us to create a plan that will bring abundance and joy in the year ahead. 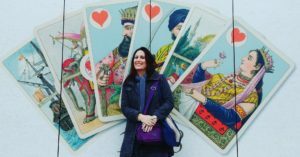 Join Lori Lytle for an exploration of your own personal Tarot Soul Card, your 2020 Tarot Year Card, and discover how they can guide you towards your greater life purpose and your everyday goals. 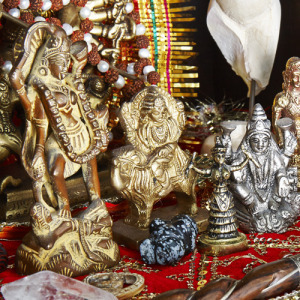 Also, take part in a little manifesting magic as we set our intention for the New Year. This class is suitable for those with a basic knowledge of the Tarot and up. Please bring a Tarot deck (preferably Rider-Waite-Smith based but all are welcome) and a notebook. 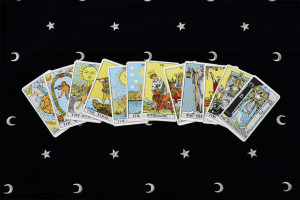 Fascinated by the Tarot, but feeling daunted at the prospect of getting to know those 78 cards? Hearing the whispers of your intuition, and looking for a way to turn up the volume? In this one day intensive workshop we will cover the two crucial aspects of learning Tarot…solid knowledge of the system and symbols, as well as firing up and trusting your own intuition. You will learn how to work with the cards as a powerful tool of clarity, self-knowledge and empowerment. By the end of the day, you will be reading the cards for yourself, and you will leave with techniques that will support you as you continue your adventure with the Tarot. Class size limited for a high quality and personalized experience. 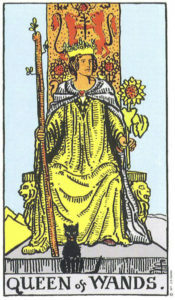 Classes are taught using the Rider-Waite-Smith Tarot (or similar). Please contact Lori if you have questions about this. Ample handouts and hands-on activities provided, please bring a RWS Tarot deck, and notebook and a pen to record your discoveries. I have read the cards for more than 25 years, they are my trusted advisors, they facilitate a connection with the universe and the Divine with in all of us. My love for the Tarot deepens day by day, and I can’t wait to share my knowledge with you. Had a taste of Tarot and are looking for more? This class builds on my Beginner Class, and is suitable for Tarot newbies with basic knowledge and familiarity with the cards. We will go more deeply into the archetypes of the Major Arcana, get into more depth with the Minor Arcana, and try out our new skills using some rock solid and useful Tarot spreads. 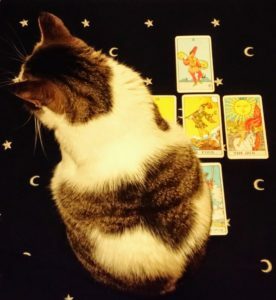 We will also learn techniques to hear and trust our intuition, and to bond with our cards. Mystified by the Tarot Court Cards? Ready to make friends with these tricky cards and make the most out of them in your Tarot readings for yourself and others? By the end of this class, those two dimensional figures will feel like new friends, teachers, frenemies, nemeses…you’ll start to sense their personalities and how they fit into your Tarot practice. This class is best for those with at least a basic/beginner Tarot knowledge and up. Please bring a Tarot deck (preferably the Rider-Waite-Smith or similar), a notebook and a pen.